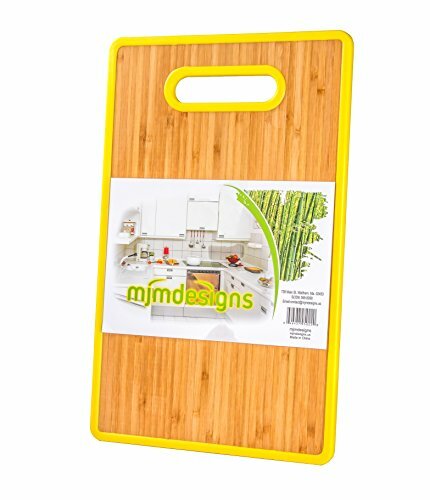 Organic Bamboo Cutting Board, Eco friendly with Colorful Yellow TPR Plastic Trim, Cut out Handle, Double Sided Antibacterial Slicing Surface for Home Kitchen Food Prep. Enjoy Easy Chopping! Product prices and availability are accurate as of 2019-03-30 07:25:09 EDT and are subject to change. Any price and availability information displayed on http://www.amazon.com/ at the time of purchase will apply to the purchase of this product. -Tired of heavy cutting boards? -Looking for an easy cleaning and storage solution? -Does effortless slicing with two different surfaces sound appealing? Try the M Kitchen Board! -It's like getting two boards for the price of one! -A user-friendly, versatile kitchen board. -Designed to handle all your food prep needs. If you're not completely satisfied, we ask that you contact us directly. We will promptly refund your money. Click the buy button now to enjoy easy chopping! Unique design, reversible with 2 different slicing surfaces, one side naturally antibacterial bamboo, the reverse TPR plastic which is non toxic for food safety, FSC and FDA approved. Lightweight, sleek but sturdy design makes for efficient handling and storage. Our board is not dishwasher safe. For an easy clean, simply hand wash with warm soapy water and towel dry. Dual food prep surfaces doubles the convenience while avoiding cross contamination between foods. Use one side for meat, chicken, and fish. The other for vegetables, fruit, and salads. 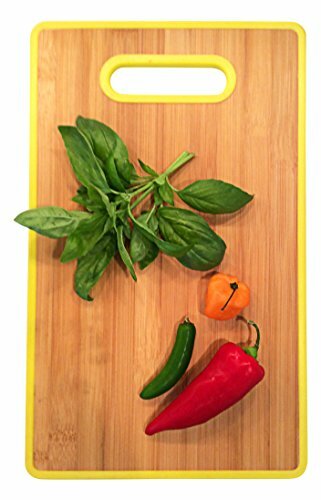 Whether you're a professional, novice, or everyday cook, this board is a vibrant, practical addition to your home kitchen. All purpose board conveniently sized (14.5" x 9" x 0.5") can also double as a serving tray.